Merlda Mace is the pseudonym of Madeleine McCoy, but beyond that, I can find very little in the way of information about this writer. 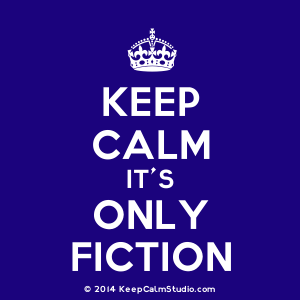 I tried obituaries, the usual mystery novelist research sources, but found nothing. Aside from this book, she's also written Blondes Don't Cry (1945) and Headlong for Murder (1943), both of which feature "nice girl, with a certain stubborness and inquistiveness" Christine Anderson as the main character. 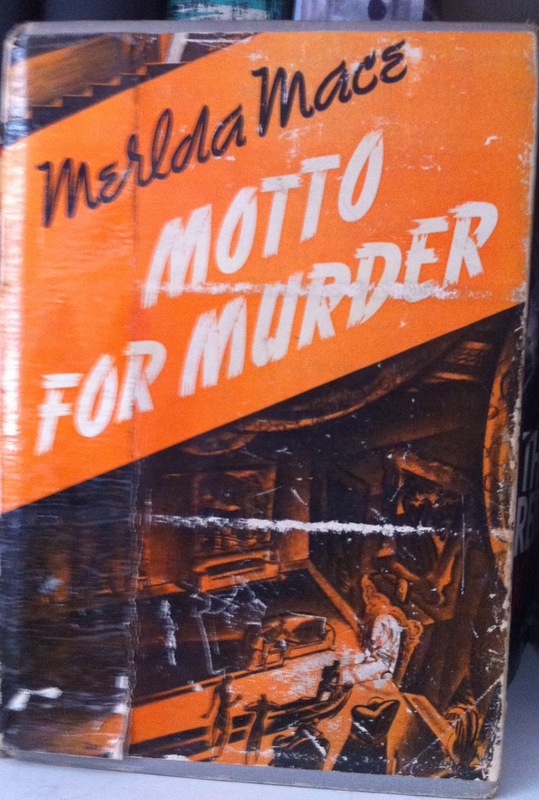 Motto for Murder was published in 1943 as well; my copy has a "Buy War Stamps and Bonds" message on the back cover. I love these old books -- even if the story isn't so great, having these old tomes in my hands complete with musty smell is heavenly. With Motto For Murder, we return to the "country house", closed-circle mystery format, only this time the house is in America, rather than the English countryside. The setting is just ripe for murder: the house is miles away from anywhere, and there's a snowstorm that turns into a raging blizzard trapping everyone inside. The main character in this story is a man who works for the investment firm of Barnes and Gleason as a special investigator. As Tip O'Neil (whose name actually made me laugh out loud) enters his office one morning, he discovers that he is about to spend his Christmas holiday playing nursemaid for another member of the firm, Jay Hammond. Hammond, it seems, had "appropriated" around ten grand or so of the firm's money, thinking he'd pay it back before anyone noticed. Unfortunately for him, the auditors found out, and Hammond now has until the following Tuesday to replace the money. If he fails, he's looking at five to ten in the big house. His plan: having been invited (along with his two siblings) to his grandmother's Adirondack home called Pine Acres, he will try to convince the old dowager (Marie Hammond) that he really really needs his share of an inheritance left under her control. The inheritance, to be divided among the three children, was left to them by their grandfather Hammond, to be given to them whenever she felt they were capable of managing their money. In short, this particularly nasty woman has continued to withhold any money to which the Hammonds were entitled, all in the name of control. Jay is constantly drunk as a means of trying to cope with his sleazy, "musical comedy actress" demanding, money-grubbing wife Ivy; he can't tell his grandmother the real reason he needs the money or he'll be disinherited. Tip is to accompany Jay to Pine Acres as a "business friend," to ensure that Jay isn't tempted to do a runner to Canada. For Tip, it's a Christmas holiday unlike any other -- first, the grandmother (who stays in her room and thumps the floor with a cane to get attention) shares her plans to disinherit the lot of them, changing her will so that they never see a penny; second, one killing turns into multiple murders with everyone stuck in the house, unable to leave. It's a country home filled with suspects, and since Tip has no emotional or financial interests connected with the family, he takes it upon himself to play detective. If there's a chance that anyone plans to take on this novel, just so you know, Motto For Murder really shows its age. As just one example, the housekeeper's daughter Molly is banking on a Hollywood career as an ice-skating actress, a la Sonja Henie, to whom she is compared in this book (and who I had to look up because I had no clue as to who she was). The title itself comes from a Christmas tradition at chez Hammond where "motto candies" are handed out and put on the tree -- somewhat like a confectioner's version of fortune cookies with couplets rather than the standard fake Confucian aphorisms we get these days. The solution, sadly, is pretty obvious and narrator Tip is a pretty crappy detective, whose one major flash of insight is accompanied by a rather excited "Jumping grasshoppers!," but I have to say that I love this sort of thing. Despite all of its flaws, it's still a fun little read, and I'm happy to have this book as part of my crime library. Absolutely perfect for cozy readers and golden-age mystery fans; it may not be the best in the bunch, but I'll happily take on a country-home murder mystery any time. This does sound interesting and I am always looking for country house mysteries although they frequently don't live up to my expectations. And mysteries published during the war are also a favorite. I had heard of Sonja Henie because I was once very interested in ice skating (watching, not doing) and my husband loves old movies. This might be right up your alley! I'd never heard of Sonja Henie, but discovered that a Norwegian airline plane had her picture on the tail. You never know what you're going to find when you start mining the old mystery novels. Definitely a fun book.